Technically, full thin skin wigs aren't variations of full lace cap wigs. A full thin skin wig is also known as a full cranial prosthesis and as another type of cap construction, deserves a guide of its own. 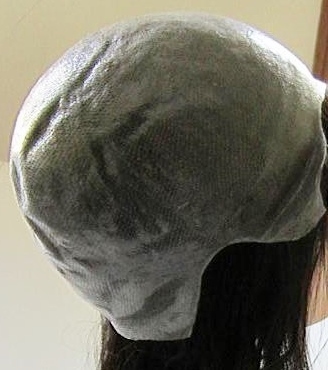 The thin skin is actually polyurethane (PU) and can be light brown, medium brown or transparent to suit different skin tones - as such these types of wig are typically custom-made items as opposed to off the shelf items. Full thin skin wigs are especially suitable for those with total hair loss (whether alopecia, natural hair loss in men, or those undergoing medical treatment such as chemotherapy). When worn the thin skin base looks exceptionally natural and provides a realistic hairline. 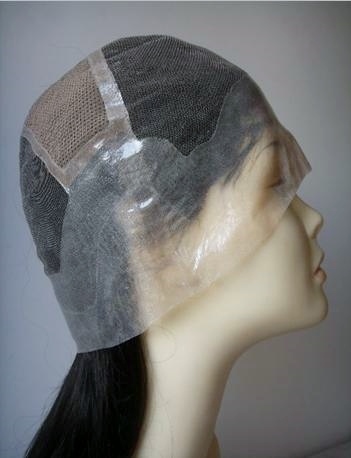 If you have total hair loss and buy custom-made full thin skin wig, then the accuracy of measurements (for both your head and wig) mean that the thin skin wig can be secured without the need for adhesives due to the PU forming a vacuum like seal. However it is not uncommon for wearers to still use some form of adhesive due to air pockets that can form underneath the wig. The thin skin (PU) bonds well with adhesives whether glue or tape. Another benefit of thin skin base wigs is that the removal of adhesive residue is much easier as you don't have to contend with lace). Generally densities of 100%-130% are preferable for full thin skin based wigs and the thin skin base is more durable than lace, so thin skin base wigs last longer (obviously the human hair must be treated with care, so excessive use of heat styling tools should be avoided). If you're new to full lace wigs, it may be a better option to choose a full lace cap wig with a thin skin perimeter before moving onto a full thin skin based wig. The development of different cap constructions for full lace wigs has been a somewhat slow burning affair but the growing popularity of lace wigs has motivated the development of different cap styles. 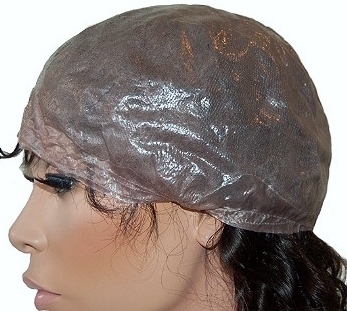 It's easy to be enticed into all sorts of options for your full lace wig cap construction, without really knowing whether you need (or even want) the whole kit and caboodle of accessories. The TCPG Top Tip for finding your way through the gamut of full lace wig cap designs is to decide: what it is you need, what it is you want and then choose your full lace wig cap construction; after all, it's going to be the hair that you wear.